When the first few notes of Spanish Graveyard’s The Altar of Sculpted Skulls rolled out I thought I might have a bit of a difficult time navigating this chaotic mess. But, then, can it be? Sunlight Studios guitar sound, in the name of Carnage, Dismember and Entombed, the Spaniards are going for the reverential all-time classic. A relatively young band, Graveyard has only been around a few years, but the root cause of their existence is obvious, Swedish-inspired death metal of the early 90s. Graveyard’s version, although plenty brutal, also has a touch of the fun aspect, a little tongue-in-cheek, if not in the song titles and cover presentation, then at least in the way their music comes off. The opening title track quickly righted its ways and proceeded with some melodic moments and finger licking solos. The tuneage, just like the vocals, are the race to the bottom end of all music registers, but Graveyard also show their ability here to grab on and ride the strong riff, just like they do at the end of An Epitaph Written in Blood, where they go all rhythmic and catchy on us. Deathcrowned also opens up with chaotic D-beating thrash, the lighter touch brought upon later with solos. As much as The Altar of Sculpted Skulls is about ripping one’s guts out in the open, An Epitaph Written in Blood and an instrumental Cult of the Shadows have an atmospheric, movie-about-zombies touch. The shredding and stomping comes on in An Epitaph Wirtten in Blood, while Cult of the Shadows stays doom-deathy, but both tracks are my better complete experiences on the record. Closers Ritual and Howl of the Black Death are re-recordings of the songs from an earlier, even more obscure, releases. 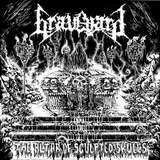 Breakneck brutalization of Ritual and tremolo to mowing shred of Howl of the Black Death showed that Graveyard wasn’t fooling around in their recent past, just like they did not intend to soften it up with the current EP. If released 20 years ago, this EP would have been a cult death metal offering. Released today, this is worship to a style which made an inerasable mark on the body of extreme metal. This is worship done well, with confidence in their musical ability and recording sound steeped even more in that lo-fi rawness and brutality which made Entombed and Dismember the flagship of many bands to come.